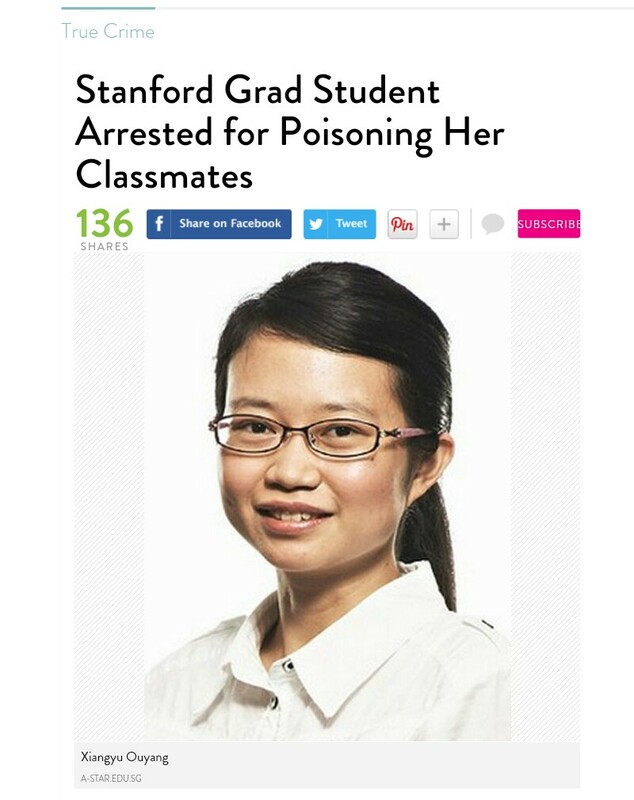 Stanford PhD Student Poisoning Her Classmates ~ How The Mind Works? It is truly an unnecessary incident and a very sad case for this young scholar as well as for her parents. 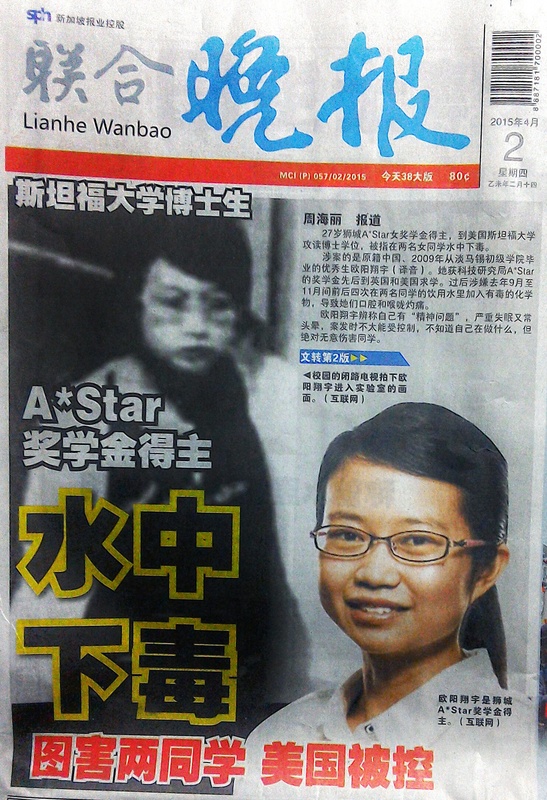 Since this case is so broadly publicized in the US and Singapore (it was on the front page news of Straits Times and others); it not only strikes on many people and in particular many parents heartstring. People are asking, what exactly could go wrong in the mind of such a “perfect young girl”?! She’s bright (of course, no doubt at all), grown up with well educated parents, seemingly a happy middle class family… the good list can just go on and on. 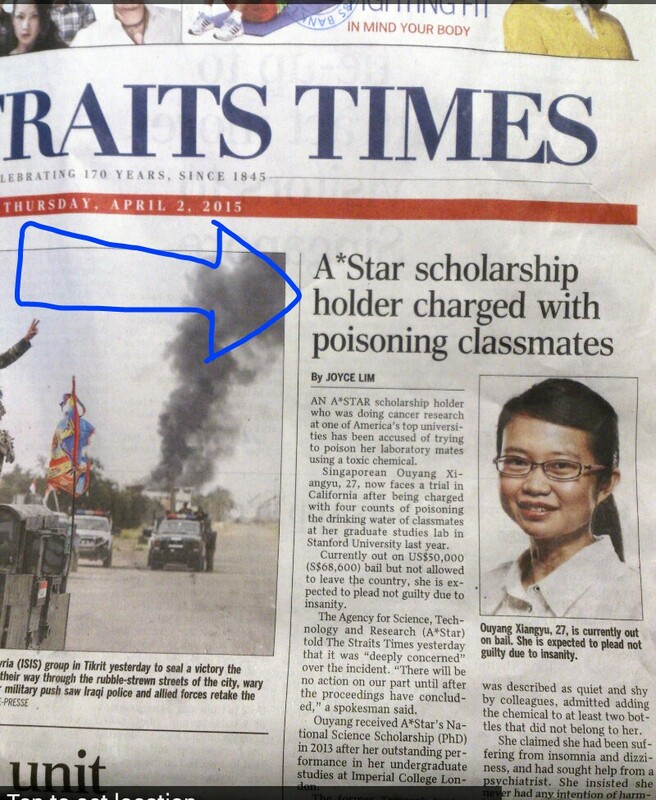 And, to top it up, she’s on a prestigious science research scholarship from A*Star. She will have to face trial in a US court. Two elements may be examined, one is of course on evidences; and the other, the mind. 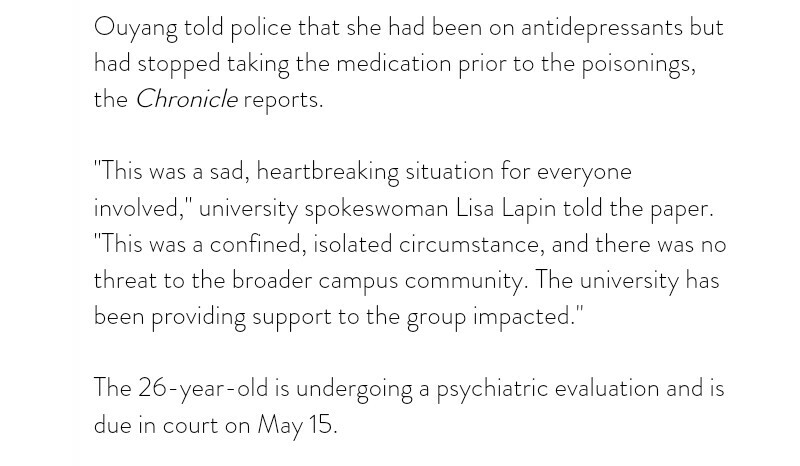 Apparently according to public media, she claims to have mental (problem) condition and under stress during the period when she committed the poisoning act. In psychology, when a person perceives himself to be under intensive pressure from the environment he’s in, and if he continues to perceive that such condition will not go away but kept intensifying; this person may end up with the final defensive mechanism, psychologically ~ Aggression! As a form of finding escape from a dire situation. Another likely possibility is for that person to adapt (acceptance) to the perceived worse condition and live with it, and to continue bearing the pain. But this requires a person to possess much higher threshold of pain in order to adapt and cope. Now that’s interesting, when this defensive mechanism (aggression) is kicked in under the above condition, the affected person can act in either of the two scenarios ~ aggression towards external subject(s) OR, aggression towards internal subject (self). The case is still in very early stage of being investigated and legal proceeding. It may be more complex then what we think. And, it is important to understand what really “Triggers” the unacceptable action by a stressful person. Because there are innocent people involved in this case. Fortunately no one is severely harmed or killed in the incident. It is a sad case. 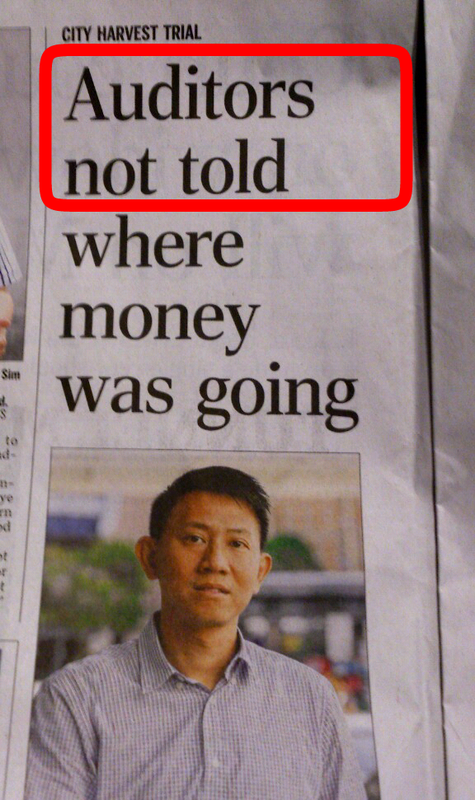 According to the news report, after some heavy “grilling”, one of the Six accuses of the trial on City Harvest Church building fund scam has finally ADMITTED that they sort of ” hide away ” from the auditors the most critical information about WHERE THE MONEY WAS GOING! If the “usage” of the money was legitimate, there’s no reason under the sun to try hiding this piece of important account information… About where the money gone to? Commoners would think so. So far for this trial, this is the most significant piece of statement surfaced in court. 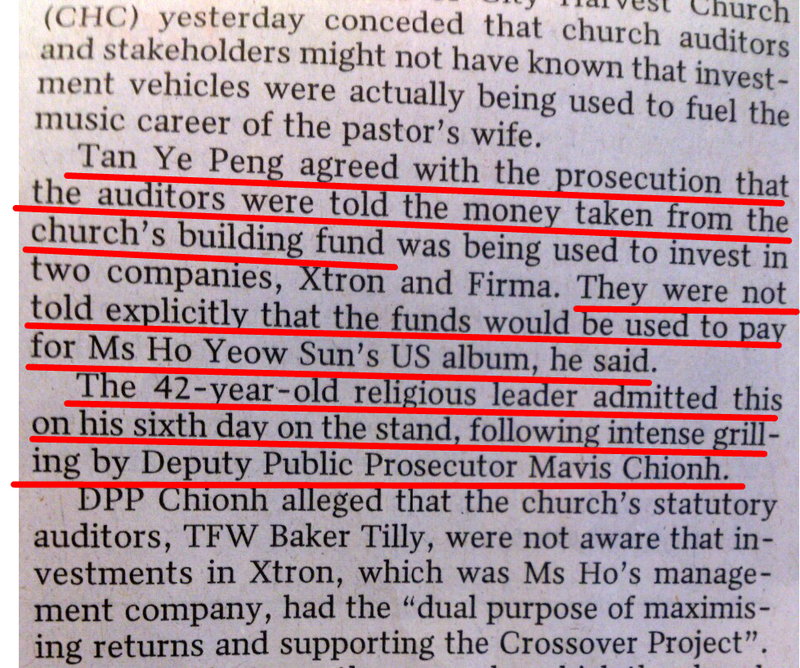 It is the court that will pass its final verdict on this long drawn trial on apparently the biggest church fund scam in Lion City history.